Lanky centre-back Emmanuel Olowo is a key player in the defence of Heartland FC. 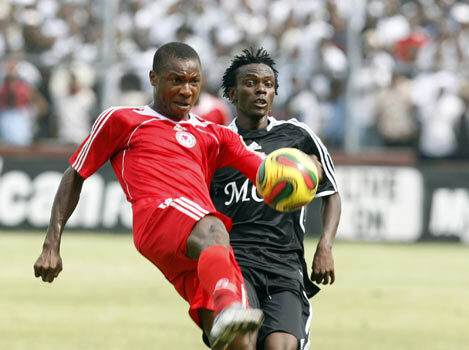 The powerful, consistent defender was team captain in several matches during the Nigeria Premier League 2012. The picture, found on MTN Football, is of Olowo. Johnson Omo is an interesting striker who could be a player to watch for the up-coming season, especially since he has joined the ambitious Warri Wolves FC. Goodluck Onamado is a versatile and experienced defender, known for hard tackles and a strong physical presence. Gomo Onduku is a skilful and pacy winger, arguably one of the most exciting prospects in the Nigerian league. Apparently, Onduku will star for Bayelsa United FC, his former club, during the Nigeria Premier League 2013. However, it is possible that European clubs will lure him away from Nigeria in the current transfer window. Enterprising winger Eddy Ongolo was one of few players of Ocean Boys FC who was able to impress during their poor campaign last season. Apparently, Ongolo will feature for Heartland FC during the up-coming season. Peter Onoja has been described as a combative and very athletic midfielder, comfortable in various midfield roles. After failing to break through at Enyimba FC, Onoja returned to Kaduna United FC, his former club. Cyril Oriaku, a super-regular centre-back at Rangers International FC, is one of the most underrated defenders in the Nigeria Premier League. The strongman, who has been highly impressive since joining the Enugu based club from amateur football, is a no-nonsense defender who tackles hard and works hard. Moses Orkuma, a regular member of the Nigeria U-20 national football team, is a petit midfielder with a tremendous work-rate. Orkuma is a great ball-winner and is known for some defence-splitting passes due to his vision and ball control.